Today, we officially crossed the border into Northern Ireland. It was about a 2-hour bus ride from Dublin along some very beautiful highways. We had all been up since 7:15 a.m. that morning so most of us spent the trip sleeping. After a quick stop at the Jury Hotel to drop off our luggage, we made our way to the gorgeous Belfast City Hall building. 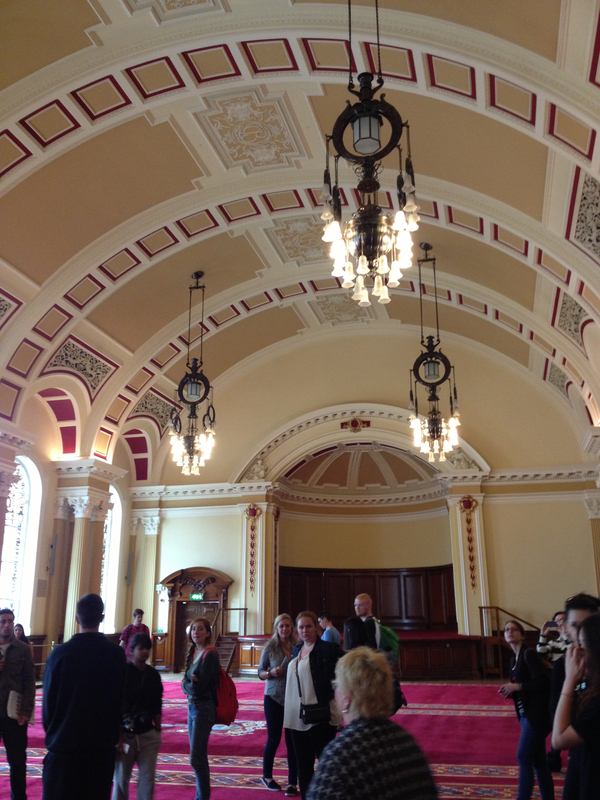 The city hall was completely paid for by taxpayer money, so the residents of Belfast feel a real sense of ownership with the building and they don’t charge for tours either. It’s clear how much tradition matters here, from the paintings of all the Lord Mayors to the ornate council room to the robes all the councilors wear. There are also three huge rooms to host both city and local functions. 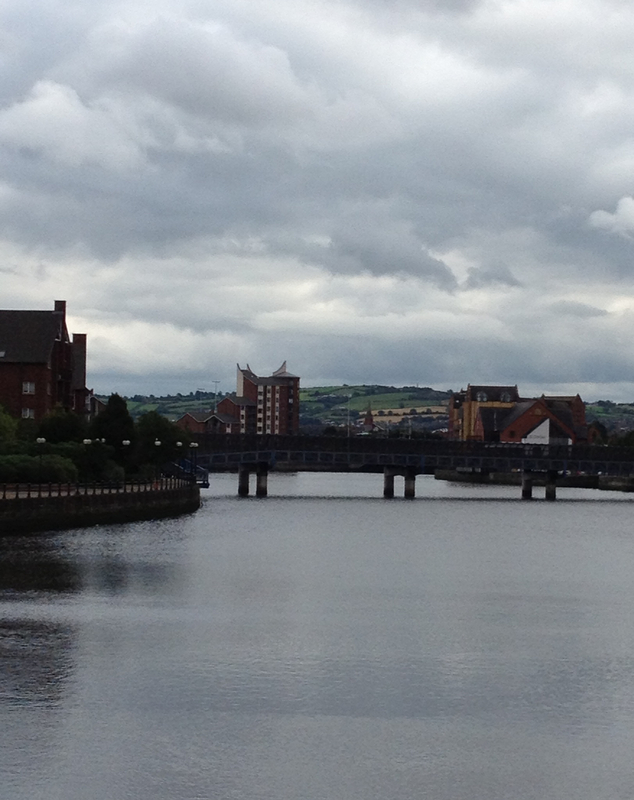 We finished the tour and then had about an hour or so to walk around Belfast a little bit and have lunch. Belfast is much smaller than Dublin but it still has a pretty built-up downtown area with lots of shops and places to eat. But unlike Dublin, you can see the surrounding green countryside from most areas of Belfast. We ended up having lunch at this diner-type restaurant located a street off from the main drag. 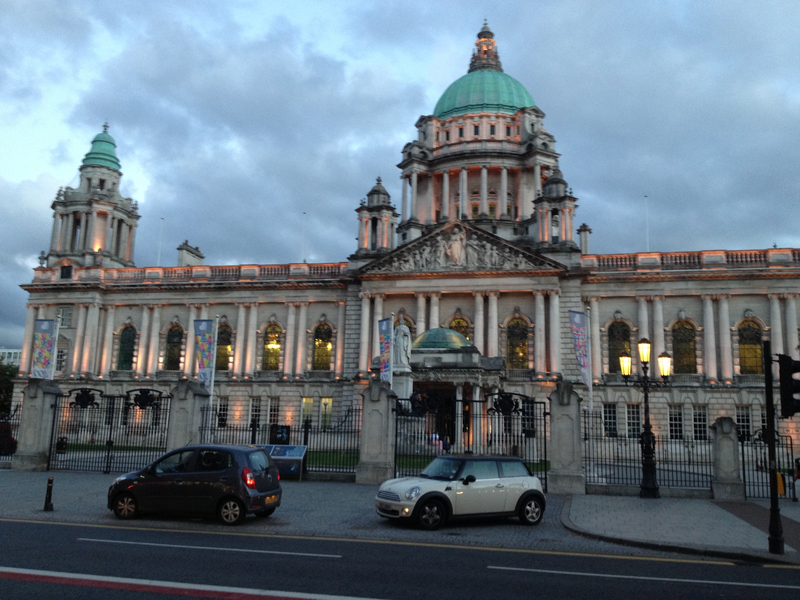 We then got to know Belfast a little better by taking a walking tour of the city. It’s definitely not as touristy as Dublin but there are still quite a number of quaint shops and streets. Like Dublin, a river, the Lagan River, cuts straight through Belfast but this river has caused some problems for the city inhabitants. Up until a weir was built in 1994, the area around the river smelled terrible because of the changing tides that often left the riverbed exposed. The tides are regulated now so the river is never completely drained and a lot more businesses and people are moving into the areas by the river. They also seem to have a bit of an obsession with the Titanic here (it was built in Belfast) and there’s a Titanic memorial and other commemorative places throughout the city.